VANCOUVER - A crash between a car and a school bus in Summerland, B.C., Tuesday night left one man dead and injured a number of kids. RCMP say the driver of a red Chrysler Sirius was killed after his vehicle crossed over Highway 97 and slammed into a school bus carrying 14 teen students from Princess Margaret Secondary School in Penticton, B.C. 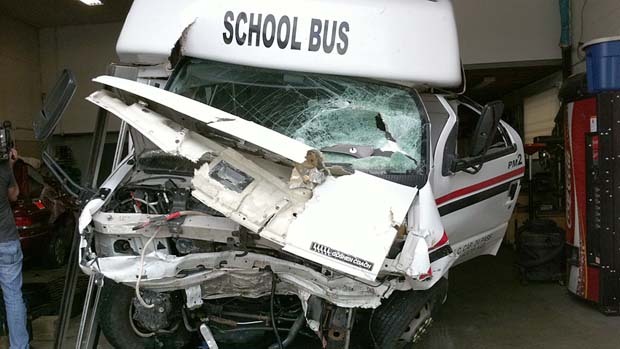 Toronto Sun: Deadly school bus crash in B.C. Vancouver Sun: One dead in B.C. bus crash. Please note they use the wrong photo of a yellow school bus. The children were travelling in a white 24 passenger MFAB, not a yellow school bus.